The Brao migrated from northeast Cambodia. They resemble Cambodian, Khmer and Lao lowlanders, although Brao are generally shorter in stature. The Brao language is a member of the Mon-Khmer language family. 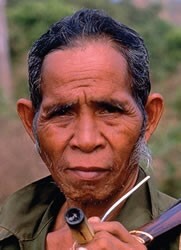 Krung, Kravet, Lun and Laveh are also names for the overall Brao people group. These variants represent mutually intelligible dialects within the group. Although they claim to be Buddhist, Buddhism only serves as a mask to underlying animistic beliefs. For instance, the Brao live in continual fear of evil spirits. Diviners determine the cause of sickness through ritual and prescribe an animal to be sacrificed to the respective spirit. Sickness is generally blamed on spirits. Pray for Christians to touch the Brao people both in deeds and words with the gospel message. Pray that God will work through Christians for Brao to recognize that in Christ there is no fear. Pray for the translation of Scripture portions and other Gospel material in the Brao language.